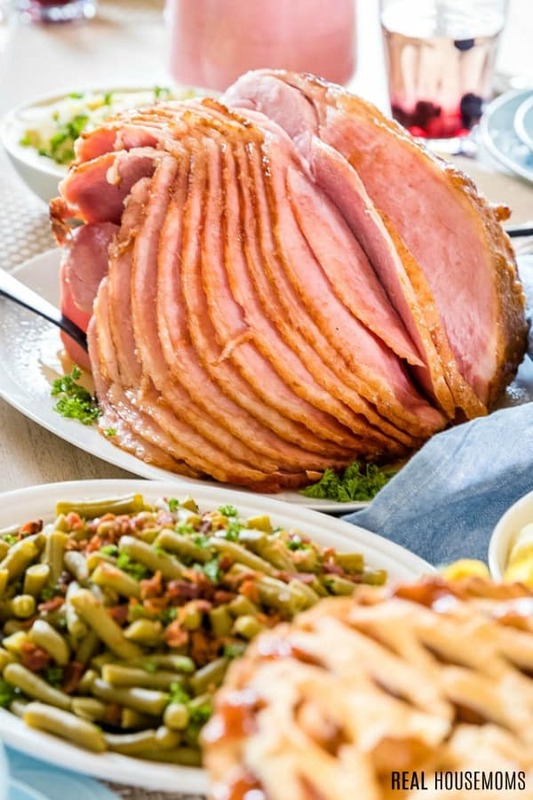 Honey Glazed Crock Pot Ham is a new spin on a traditional holiday favorite that will leave your family convinced that you ordered out this year! I am one of those people who truly does love holidays and cooking for my entire extended family. I love the traditions we have and the feeling of knowing that I am passing those on to my children. What I do not always love, however, is cooking the same elaborate holiday meal several times a year. Between Thanksgiving, Friendsgiving, Christmas Eve and Christmas Day, Easter, and every holiday pot-luck in between, I absolutely need a break from turkey. 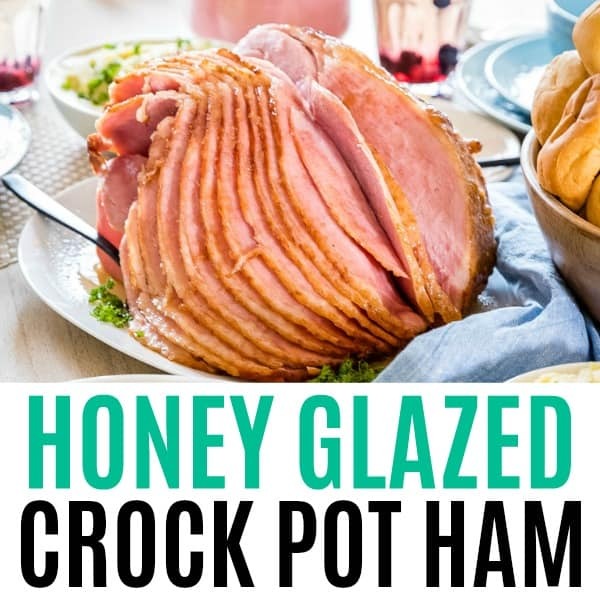 For this reason, I am opting out of turkey this year and preparing this amazingly simple, unique, and delicious Honey Glazed Crock Pot Ham. Pro-Tip: This Crock Pot Ham is the perfect prelude to my favorite holiday recipe for ambrosia salad. Like this recipe? Pin it to your DINNER pinboard! Holidays are always a busy time at my house. Some families flip-flop their holidays, spending one year with one family and the next year with another. In my house, more times than not, I have both sides of the family coming together under the same roof, at the same time, to celebrate. It is awesome to get to spend the holiday with literally everyone we love, but it does equate to a lot of mouths to feed. 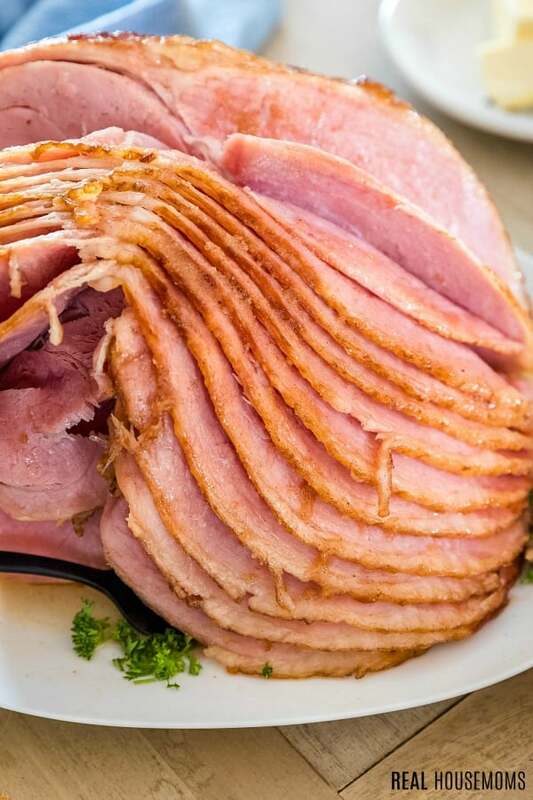 This year I decided why not make dinner prep easy and cook a holiday spiral ham in a Crock Pot this year? You might be wondering if you read that correctly, but I assure you that you did. Ham in a Crock Pot. Granted, you need a full-sized Crock Pot to pull this recipe off, but it is truly a game changer. Imagine all the extra room you would have in your oven for all the other side dishes, pies, and dinner rolls. 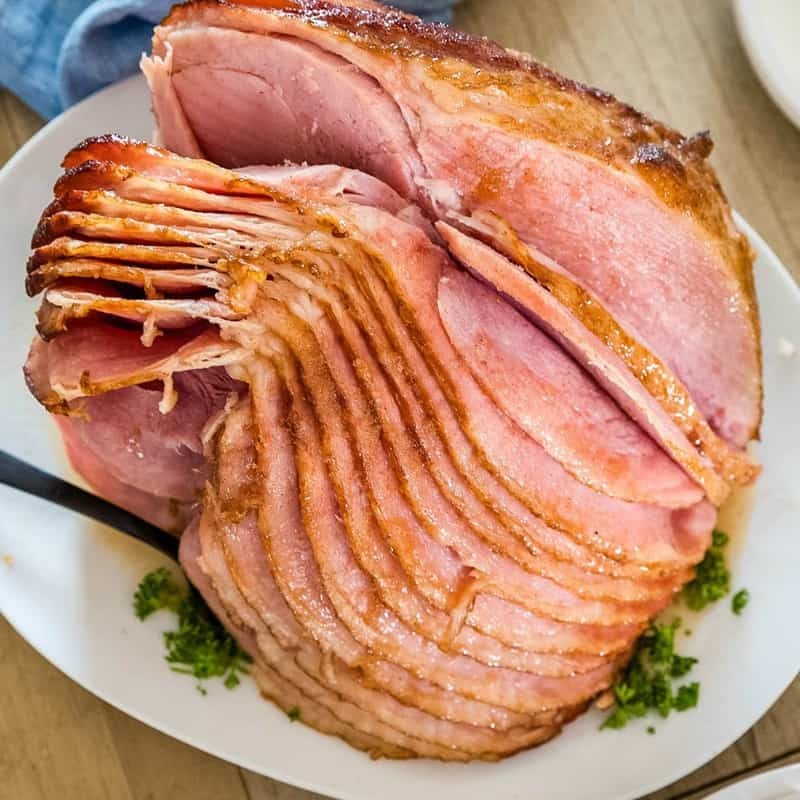 With this Crock Pot Honey Ham, you can basically prep it, set it, and forget it until you are ready to add a signature glaze that will make everyone think you were slaving away in the kitchen all day. After 4 hours in the Crock Pot, and just a few minutes in the broiler, you will have the most delicious Honey Glazed Ham with the most perfectly caramelized glaze that you have ever tasted. Spray slow cooker with non-stick spray. Put ham in slow cooker. Stir together butter and honey in a bowl and then pour over ham. Cover slow cooker and cook on LOW for 4 hours. Remove ham and place in baking dish. In a bowl, combine sugar, onion powder, cinnamon, nutmeg, garlic powder, cloves, ginger, and paprika. Sprinkle ham over ham. Broil ham on HIGH until caramelized. Put remaining half of sugar mixture in a small saucepan with 3 tablespoons water. Heat until sugar dissolves. Pour over ham and broil 1-2 minutes. Serve warm or at room temp. Since the ham is already cooked and you’re really just reheating it, cook the ham on LOW in the crock pot for 3-4 hours, until a meat thermometer inserted in thickest part of the ham reads 140 degrees F internal temp. This cooking time will work for a 6-pound to 11-pound bone-in ham. Just because you are entertaining guests, does not mean that you need to go over the top and reinvent the wheel when it comes to serving dinner. Do yourself a favor this year and keep it simple so you can spend more time enjoying those around you. As an added bonus, these delicious leftovers (if there are any) also double as the perfect excuse to make Slow Cooker Ham and Potato Cheese Soup as a next day reward for all of your hard work. It does not get much better than that! 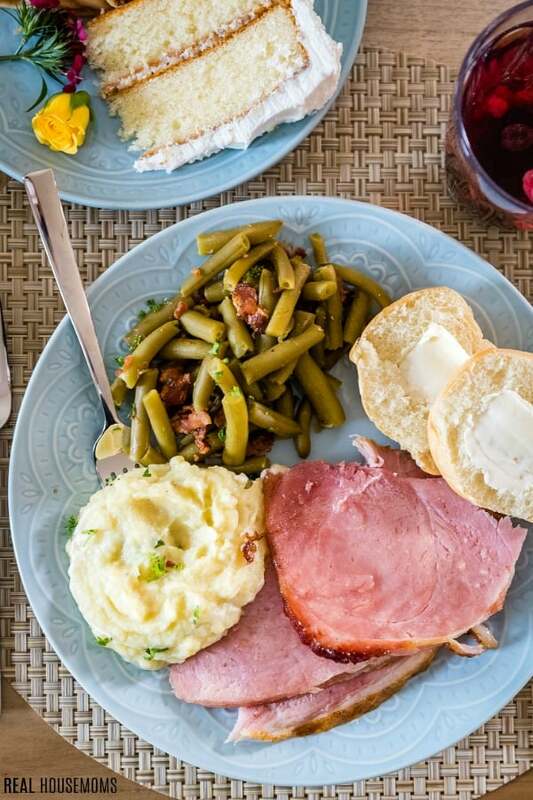 Try some of my favorite recipes to serve up with this ham! Slow Cooker: I love this crock pot! The lid is very secure and I can pack it up and take it on the go if I’m heading to a potluck. This slow cooker is a workhorse in my kitchen and has worked great for years! Small Saucepan: While I use bigger saucepans for everyday cooking, having a small saucepan lets me make syrups, toppings, and sauce add-ins without taking over the stovetop. Whisk: This is my favorite set of whisks. There’s a size for every job and the thicker handles give me a good grip. Coat your slow cooker with non-stick spray. Place ham in crock pot. In a small bowl, stir together butter and honey. Pour over ham. Cover crock pot and cook on LOW for 4 hours. Remove ham from crock pot and place in a baking dish. Put the other half of the sugar mixture in a small saucepan with 3 tablespoons water. Simmer over medium heat until the sugar dissolves. Remove ham from oven and pour glaze over ham. Broil 1-2 more minutes, keeping an eye on things. Remove from oven and serve warm or at room temperature. The cooking time on this recipe will work for a 6-11 pound ham. If you close your crockpot because the ham's too big, don't worry! Cover the slow cooker with foil and place the lid on top of the foil to seal in the heat. I’m Aubrey. I’m Mom to two little monkeys and married to my best friend. I love finding food that’s easy to make and my family loves! Real Housemoms started as a way to share recipes with friends, now I just have a lot more friends!